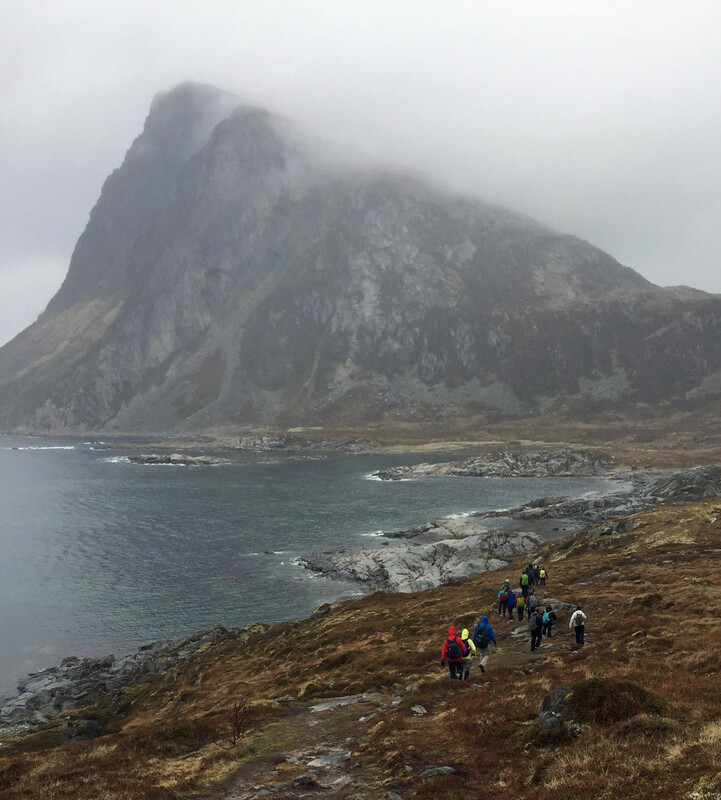 The Geology 310 course has been in Norway for nearly a week, and we are enjoying the diverse terrain of the Lofoten Islands. The weather has been suitably pleasant, it is downright mild by Arctic standards with an ever-changing mixture of clouds, bits of sun, and only a few spots of light rain (thus far). We are encamped in a rorbu, a traditional style cottage on the water’s edge, in Henningsvær at the southwest edge of Austvågøya. 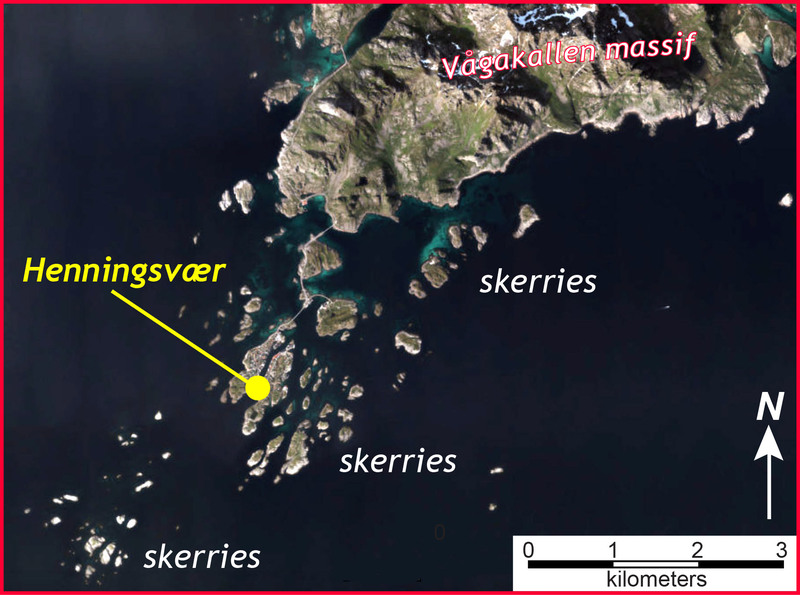 Henningsvær is a village scattered across a set of rocky islands about 1.5 kilometers from the mainland, and is surrounded by the sea and backed by the towering Vågakallen massif standing nearly 1 km above sea level. Here in Henningsvær we look out at hundreds of little rocky islets known as skerries*, and these are common features along the Lofoton coast. We’ve asked our students to figure out how the skerries formed – what earth processes have conspired to create these landforms? Skerries, just offshore from Henningsvær, in the late evening Arctic sunlight. 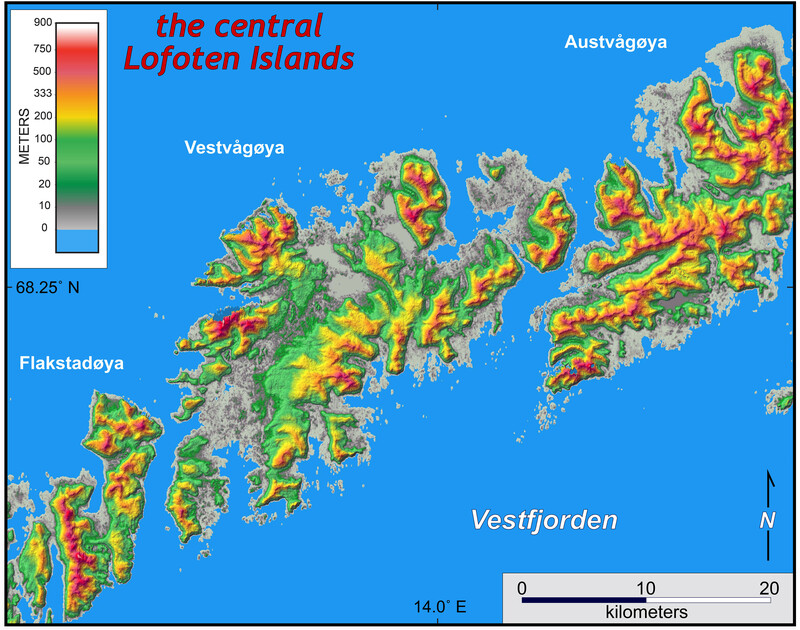 The Lofoten landscape is distinctive, and comes in two basic varieties: alpine terrain that is steep, rugged, and rocky with peaks rising abruptly to elevations between 400 and +900 meters above sea-level, and a broad low terrain, within ~30 meters of sea level, that’s known as a strand flat. These topographic elements frame Lofoten’s landscape that has been shaped by both glaciers and shoreline processes. View to the southeast of Henningsvær with Vestenfjorden in the background. Note the steep alpine terrain, the abundance of skerries, and the cloud ceiling below the highest peaks. Henningsvær is on the strand flat, and there is also a strand flat in the foreground. Click on the image for a larger view. Our days have been busy as we’ve spent 10 to 12 hours outdoors each day examining both bedrock and surficial geologic features. 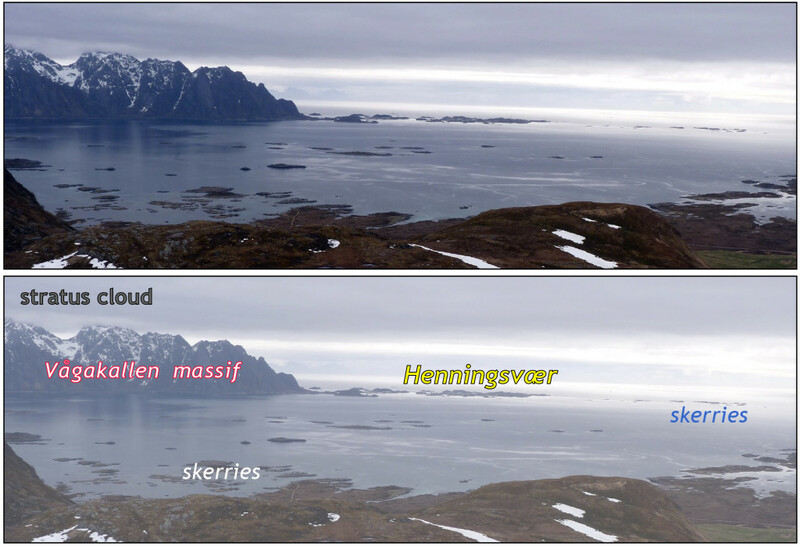 Thus far we’ve hiked up many fjords, measured fractures along coastal outcrops, examined beach ridges, discussed the ever-changing cloud ceiling, dined with Vikings at the Lofotr Museum in Borg, and climbed mist-covered peaks. We spent one day in the Trolldalen valley mapping surficial deposits. This valley contains moraines, distinctive landforms composed of till that were deposited by past glaciers. Some of Trolldalen’s moraines are massive. Our students had seen moraines on topographic maps, but it’s a far more authentic experience to climb up and onto a moraine. What follows are a few pictures that illustrate our busy days and ‘nights’ here in Lofoten. *skerries is the plural of skerry, which is derived from an old Norse word (sker) and effectively means rock in the sea. The hike towards Offersøykammen, a 434 meter tall peak, northwest of Leknes. 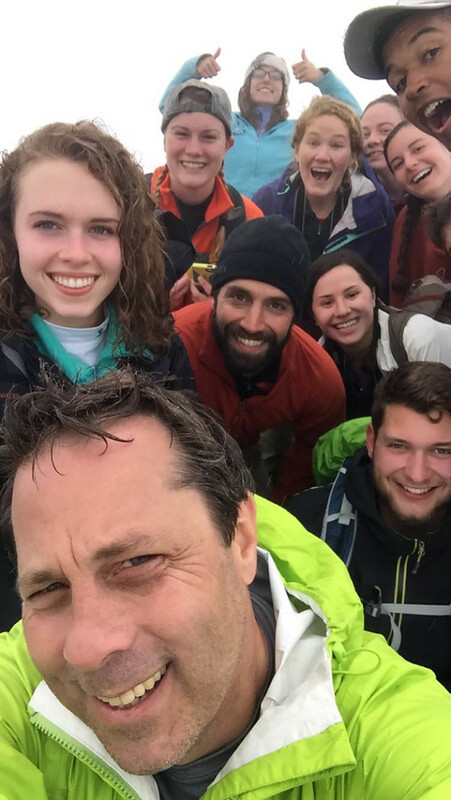 Happy people on the foggy summit of Offersøykammen. 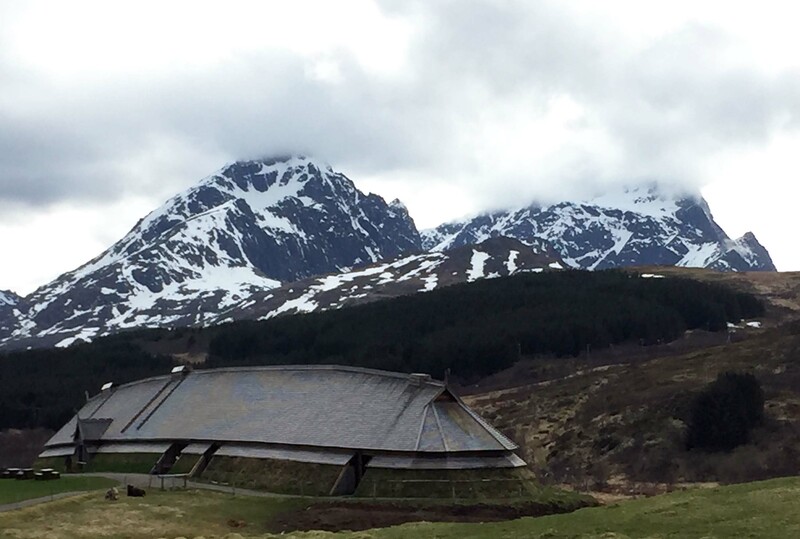 Reconstructed Viking longhouse at the Lofotr Museum. William & Mary geologists mapping surficial deposits by the partially frozen Nedre Trolldalsvatnet, Lofoten Islands, Norway. 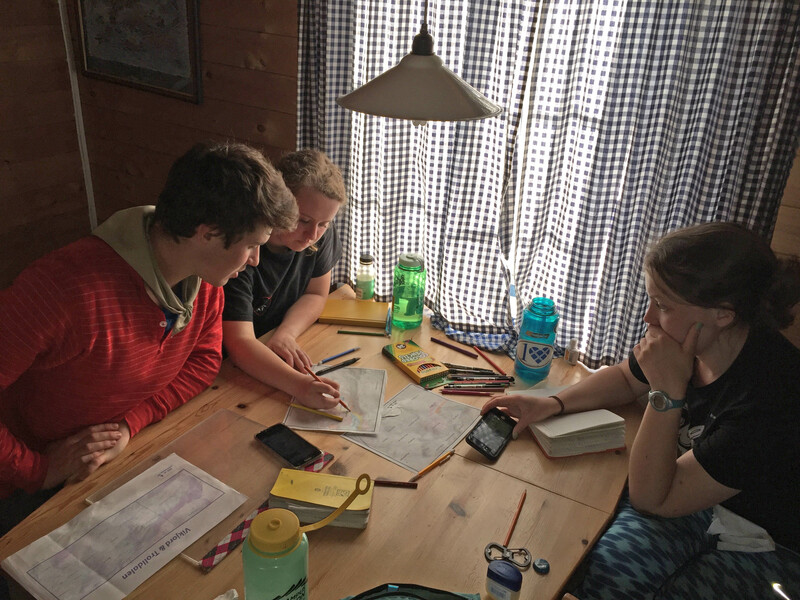 Josh Himmelstein, Katie Lang, and Hope Duke working late into the Arctic ‘night’ on their Trolldalen map. Class bonding. 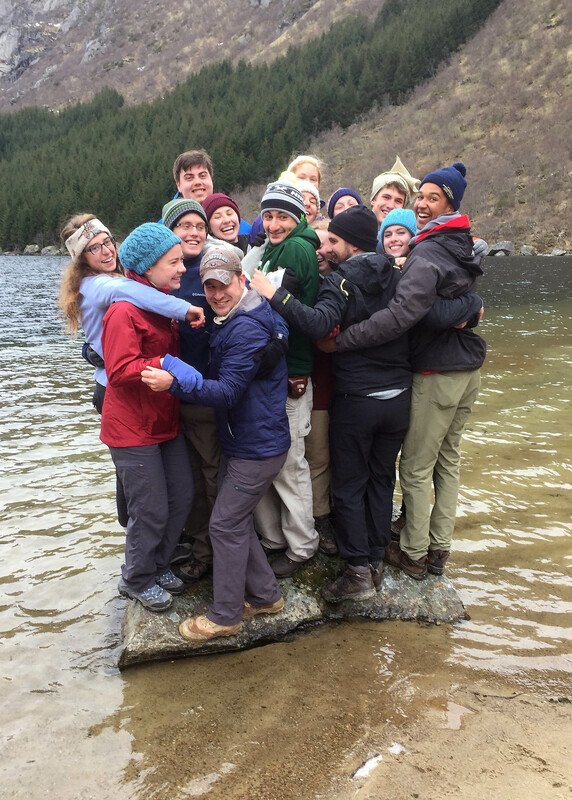 All 16 of the Geology 310 students on a rock in the middle of Djupfjordvatnet. So cool! Wish I could be there, but this blog makes me feel just as cold and Nordic as you all! Tell Nick I said No Invite. Also, ask the Vikings if they were the first to settle the Faroe Islands. 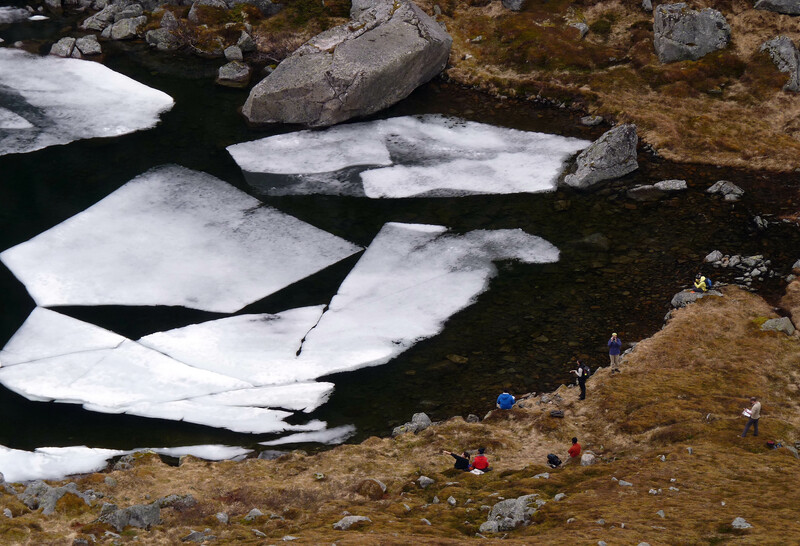 I’ve counted 3 times….I see 15 students on that rock! 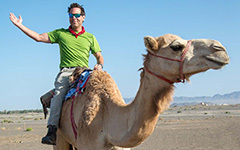 I’m thrilled you all are having fun and learning about glacial landscape. It would be really neat to go to Patagonia next time and make landscape comparisons….I’m up for that.